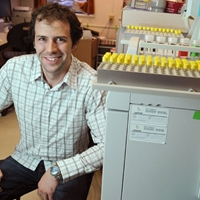 Metherel, a 32-year-old post-doctoral fellow at the University of Waterloo, is receiving an award this week to recognize his work on an innovation that improved the time-consuming and tedious process of measuring fatty acids and cholesterol in food and tissue samples. Metherel, who developed the new process in conjunction with Certo Labs Inc. in Waterloo, is the recipient of the Mitacs and NRC-IRAP (National Research Council-Industrial Research Assistance Program) Award for Commercialization. It is given for an outstanding idea that has been or will soon be commercialized. Certo Labs turned the innovation into kits that are sold to laboratories in Canada and Argentina. The kits are used to measure fatty acids, such as healthy omega-3 or harmful trans fats, for food labelling and other uses. Researchers need to know, for example, the fatty acid content in lab animal diets. Metherel is one of five national award winners chosen from the Mitacs programs that bring industries in need of solutions together with university researchers. The programs are part of a "new paradigm" for making commercialization happen, said Arvind Gupta, chief executive of Mitacs. Certo Labs needed to improve fatty acid and cholesterol analysis, so Metherel started working on that project while doing his PhD in kinesiology at the University of Waterloo. "It wasn't something that was directly related to my thesis work, but it turned into a side project," he said. The conventional method is tedious and time consuming, Metherel said. It involves manual pipetting, as well as putting samples through a centrifuge to separate the contents. The innovation involves a special filter attached to a syringe, turning it into a one-step process. Just doing away with manual pipetting can save a lab about minute or minute and a half per sample, Metherel said. If a lab is doing 40 samples, that alone will save almost an hour of time. The system works well, he added. "For all of our comparisons so far we have seen no difference between the standard method and our method. In most cases, we are actually getting more consistency." 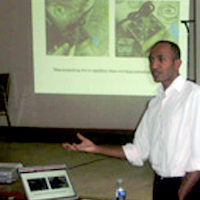 Metherel worked on the system under the supervision of University of Waterloo professor Ken Stark. He said he is "honoured" to receive the award, which comes with $500 in prize money. "It's pretty nice to see a finalized project from years of research turned into something that is actually available commercially," he said. Metherel is continuing his research at UW to apply the technology to other substances, such as measuring pesticides and broad-spectrum antibiotics. "When you are talking about extracting an analyte from tissue or food, it is usually a relatively tedious process," said Metherel. Gupta said most people think of innovation in terms of software or drug development, but this is an example of an innovation that improves productivity. "We look at innovation more broadly, not just narrow sectors," he said. 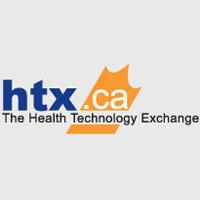 "Certo Labs receives funding from the Business Investment Program (BIP) from The Health Technology Exchange in partnership with Ontario Centres of Excellence (OCE) and National Research Council - Industrial Research Assistance Program (NRC-IRAP)." Standard laboratory techniques employed within research and contract research organization (CRO) labs for the quantification of nutrient and toxin levels in food, animal /human tissue and blood are performed manually and include a series of steps which include: homogenization, or the emulsification of the sample; extraction of the desired nutrient, drug or toxin using high volume solvents; and derivitization, which refers to the chemical modification of the extracted compound so that it can be analyzed on an analytical instrument such as a mass spectrometer. The problem with standard laboratory techniques is that the process is time consuming and is hindered by the fact that it is operator dependant and therefore prone to error. Identifying this problem, Certo Labs has been developing an automated sample preparation system for CROs that can homogenize, extract and derivitize nutrients, drugs and toxins in a rapid, inexpensive and accurate fashion. Because regulatory agencies such as Health Canada and the FDA mandate that companies associated with food, drug and health industries perform compositional analysis for quality control and toxicity monitoring, samples are typically outsourced to CROs that perform the analyses using standard, low-throughput and expensive laboratory techniques. Certo's system aims to alleviate the burden placed on many labs that face manual preparation. The project that Certo undertook with their partner Dr. Ken Stark, and his trainees, Mr. Flaviu Ciobanu and Adam Metherel, at the University of Waterloo (Waterloo, ON), tested two novel approaches for extracting and derivitzing analytes from blood and food. The project?s objective was concerned with expediting current sample preparation techniques to enable high throughput nutrient analysis of food samples and biomarker quantifications in plasma and tissues. Certo was able to develop two patentable and automation-amenable processes for blood, food and tissue extractions and these processes were later transformed into a kit, which was tested and validated in Dr. Stark's laboratory. Although the initial objective was to sell an automated high throughput instrument, the present goal is to initiate immediate sales of the kit after filing a process patent, while continuing the development of the machine. The advantage of initiating kit sales over an instrument is that it can potentially be used in both low throughput and high throughput labs, whereas the instrument would only be confined to high throughput labs. Certo aims to commercialize this kit by the end of 2011; beginning with labs within their network, who have expressed interest in the kit, and then by outsourcing sales to a distributor. The company also plans to continue integrating the kit process into the Certo-Ex device. Certo has recently validated the kit separation process with a multinational Canadian enterprise involved in creating scientific instrumentation. Additionally, next steps include plans to conduct another pilot with the largest independent analytical laboratory service company in Canada to help refine the kit and initiate sales. There's something fishy going on in Ken Stark's lab. 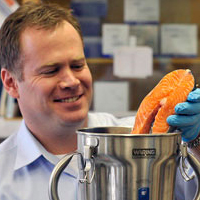 The Assistant Professor in kinesiology develops innovative ways to uncover how much Omega-3 Canadians are consuming. He's testing not the food they eat, but the blood in their veins. "Trying to figure out what people eat is very difficult because they lie or forget," says Stark, seeming to channel House from the hit television show. "So we use blood instead of asking questions." "Trying to figure out what people eat is very difficult because they lie or forget. So we use blood instead of asking questions." Omega-3 fatty acids are essential fatty acids necessary for human health and are found only in food. Health agencies encourage people to eat Omega-3-rich fish, particularly fatty fish such as salmon, mackerel, lake trout, sardines, anchovies, and albacore tuna to slash the risk of heart disease. Traditional means of analysis can be time-consuming or unreliable, depending on the method. For instance, if a subject eats salmon one night and is asked the question, "How many servings of fish have you eaten in the past week?" the results can become skewed if that was the only plate of fish eaten all month. Analyzing blood samples, however - what Stark calls "dietary forensics" - negates the need for questions at all. Blood analysis is not only relatively quick: blood doesn't lie. Stark's methods have caught the attention of Certo Labs Inc., a Toronto-based startup that is developing and commercializing a new device that tests food samples so nutrition labels are accurate. Stark submitted the patent with the company to make it happen. "If I hadn't been at Waterloo, I don't know I would have pursued it," says Stark. "But I'm glad I did." "Certo receives 'Business Investment Program' funding from the Health Technology Exchange Program at MaRs for developing high throughput sample preparation methods with the Universtiy of Waterloo"
Certo Labs is developing an automated sample preparation system for analytical and contract research laboratories. Standard sample preparation laboratory techniques are expensive, time-consuming, error-prone and operator dependent. Certo's system will help alleviate the burden placed on many labs that face manual preparation for the analysis of nutrients, drugs and toxins at a low throughput of 20 samples per technician per day. The technology is being developed in collaboration with the Department of Kinesiology at the University of Waterloo and with the Toronto-based engineering company, Kangaroo Design and Innovation Inc.
Certo labs advance chemical extraction Toronto-based Certo Labs has developed a device that could revolutionize the time and money spent by the pharmaceutical, environmental and food industries on extracting samples from drugs, foods and contaminated soils for analysis. Certo Labs? 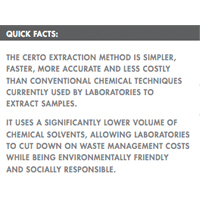 Certo-Ex is a lab device that offers quantitative extraction of targeted compounds, such as nutrients, fats and other elements from solid samples like food. Its simple concept streamlines sampling, bringing a process that has historically taken up to 24 hours for a single sample, down to 30 minutes for multiple samples. "Through OCE we were able to make the industry connections that led to the research collaboration with the University of Waterloo," says Ameer Taha, Certo Labs' Co-Founder and Chief Scientific Officer. Certo Labs, founded by Ameer Taha, Ahmed Taha and Lahav Gil, is pleased to announce that it has received the follow-on year award for the Martin Walmsley Fellowship for Technological Entrepreneurship in the amount of $50,000. This honour is awarded by a special committee of the Ontario Centers of Excellence (OCE) comprised of technical and business experts, to academic innovators turned entrepreneurs. Certo Labs is currently progressing its lead product and business with the assistance of OCE, University of Waterloo's Ken Stark and Kangaroo Design & Innovation. Kangaroo is incubating the product development of the Certo Ex (Certo Lab's lead product - a homogenizer of solid matrices) through in-kind services and special payment terms. Certo Labs and Kangaroo Design & Innovation would like to thank the OCE for all the support and development activities that have assisted in Certo's successes and progress to date. Special thanks is extended to Dr. Karen Temple, Business Development Officer for the OCE's Centre of Excellence for Materials and Manufacturing, who has worked tirelessly to guide Certo towards a successful Walmsley Award and many other initiatives on the road to bringing the Certo-Ex to fruition. Certo Labs Inc. showcased its first prototype at the annual OCE Discovery exhibition held on May 11-12, 2009 at the Metro Convention Centre in Toronto, ON. 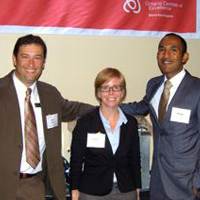 Certo's engineering team presented live demostrations of food extractions (such as shrimp, coffee beans and steak) and were able to illustrate the ease, convenience and significant cost savings that arise from using the Certo-Ex device as opposed to conventional extraction techniques. 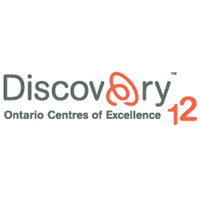 OCE Discovery 2009 was held by the Ontario Centers of Excellence and featured close to 300 exhibitors, more than 2,000 attendees and hundreds of researchers, investors and entrepreneurs. "Find your passion and follow it" was the mantra Dr. Ameer Taha drilled into the ears of more than 30 children between the ages of 2 and 13 at a Youth Action Alliance event held on March 20, 2009 in Toronto, ON. Taha, co-founder of Certo Labs Inc., was invited as a guest speaker to inspire young children into discovering their passion at an early age. "Pick something that you like, get really good at it, and you'll be surprised as to how far you can go", said Taha, who had devoted his younger years towards the refinement and perfection of his scientific talents. This seminar was the first among a string of motivational speeches that the aspiring 26 year old entrepreneur plans to attend as a means of mobilizing emerging talent in our local communities and encouraging young students to pursue their passion and succeed. 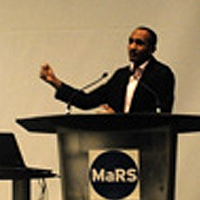 Dr. Ameer Taha, Co-founder of Certo Labs Inc, was invited as a guest speaker to present at the National Business and Technology Conference held at the MaRs Discovery District on March 20, 2009. Taha's lecture emphasized the lack of collaboration between academic professionals and commercialization partners which is crucially needed in order to transform innovative "lab" ideas into business opportunities. Taha encouraged the audience, comprised of students from an array of backgrounds, to pursue their research and development work further by attempting to identify market opportunities for their work and collaborating with industry partners who can bring their ideas to fruition. The conference was a great success with more than 100 attendees.